Mon 15:00 The Formula 1 circus has long worried about the readiness of the all-new Yeongam International Circuit, but last week the facility was passed by FIA race director Charlie Whiting and round 17 of the 2010 world championship goes ahead as planned. South Korea is ready to join motorsport's big-league as final preparation work feverishly continues at the 5.621 km track on the south-west coast, while an air of unpredictability reigns with many more questions than answers going into this event. Weather could also turn out to be a question mark as the week continues, thanks to the development of heavy rains associated with Super Typhoon Megi. Since last Wednesday, leading meteorologists have been studying the potential fallout from the category five storm as it headed for the Philippines. While the Typhoon itself is certainly not a threat to Korea, bands of rain are currently sweeping north towards Shanghai and Japan, but critically hovering just out of range of the Korean coastline. With the final layer of asphalt only being completed 10 days ago, concerns were immediately raised over the very short curing time and potential for oils in the surface to provide an extremely slippery driving experience. Fortunately, there has been no rain at the circuit for a week and the initial forecasts suggest that the Yeongam circuit will remain dry for another seven days - much to the relief of the circuit's organisers. The event will kick off on Friday with dry and mainly sunny conditions so that the drivers can learn the circuit without any interference from the weather, with temperatures reaching 22 degrees. Saturday will bring a slight change in as cloud begins to encroach on the coastal circuit, but another dry day of track action is expected as temperatures again hit 22 Celsius. Race day has been predicted to be a dry affair for some time now, with a maximum of 22 or 23 degrees Celsius. But, with rain steadily approaching from the west and south, the teams will need to continue watching the fallout from Typhoon Megi incase of any sudden changes. Currently, the next rainfall is not expected to hit the circuit until Monday night, which has been the case for several days of weather model calculations, but the system needs to be watched carefully as we go through the week. In summary, we expect a dry weekend from start to finish as the drivers tackle the slippery and dusty Yeongam circuit for the first time in pleasant temperatures, but with half an eye on Sunday - just to be sure. AUTOSPORT Live will of course be monitoring every forecast dataset as it becomes available and a further update will be published on Wednesday afternoon. Wed 09:15 Preparations are continuing at Yeongam as Formula 1 gears up for the first-ever Korean Grand Prix, with little change in weather prospects since our original forecast on Monday. The Jeollanam-do region has been blessed with a good run of dry weather recently. Indeed, today is the ninth consecutive day without rain since a light shower fell last Monday afternoon, and this trend is set to continue as upper-level winds in the atmosphere above the East China Sea prevent the heavy rain emanating from Typhoon Megi advancing as far north as the Korean peninsula and instead carry it across to Japan. Thursday and Friday at the circuit will be pleasant, with a good deal of sunshine around for the media and spectators to enjoy. Temperatures in October have reached the low 20s Celsius range, but it will be a touch cooler on Thursday with a maximum of just 18 Celsius, rising to 21 degrees on the first day of running at the circuit. A change in conditions is expected on Saturday as a blanket of cloud rolls in from the west. It will remain overcast for much of the day, but there is no credible threat of rain. With a maximum temperature of 20 Celsius, and high humidity at around 80 percent, it will feel quite sticky outside and it will be interesting to see how the cars perform in such conditions. Usually, the cars only run in high humidity when coupled with high temperatures, but his will not be the case on Saturday. 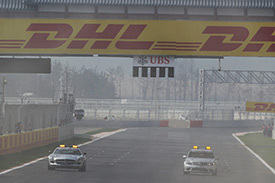 Many observers are becoming concerned over the threat of rain for race day, though there is not sufficient evidence just yet to suggest that the Korean Grand Prix will become an skating competition. Sunday will likely dawn overcast at Yeongam, but sunny spells are expected to develop through the morning and continue through to the afternoon, leaving the grand prix as a dry and bright affair, with temperature gauges registering 22 or even 23 Celsius in the warm sunshine. In summary, the latest forecast models released today point towards the likelihood of a fully dry weekend. AUTOSPORT Live will continue to monitor the latest data and we will publish a further forecast on Thursday afternoon, as the anticipation builds ahead of Friday practice. 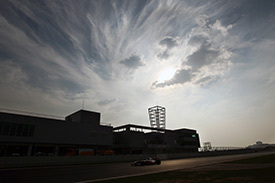 Thu 12:50 Feverish work continued at the Korean International Circuit on Thursday, but there were plenty positives for the organisers as the drivers gave their thumbs up to the all-new 5.621 km venue. The weather also played its part to the full on Thursday with bright sunshine beating down on the circuit as workers continued readying the grandstands, painting lines, attending to kerbs and run-off areas as well as sweeping the track itself. Another sunny day is in prospect tomorrow as the drivers hit the circuit in anger for the very first time. Track conditions will undoubtedly be slippery, as demonstrated by the safety and medical cars this afternoon as they toured the circuit to get a feel for the layout. Both practice sessions are set to take place in dry and sunny conditions, with some light cloud around. Humidity levels will be high at around 75 to 80 percent on average, as temperatures climb to 22 degrees in the prolonged sunny spells. Overnight, cloud will roll in from the south west and Saturday's action will take place in overcast but dry conditions. With the high humidity, it will feel quite muggy under the cloud-laden skies, as temperatures reach a degree or two lower than Friday's value at 20 degrees Celsius. Overcast conditions are forecast to remain on Sunday. A large swathe of rain will be on the move to the south of the Korean coastline, between China and Japan, but the majority of latest forecast model projections continue with a dry theme for the race, with temperatures peaking at 21 Celsius. Tomorrow will undoubtedly be a difficult day for the drivers with potentially horrendous track conditions at the start of practice. Snakes have even been sighted on the circuit in the last 24 hours, so literally anything could happen during the first two practice sessions. AUTOSPORT Live will be on hand to register and record every spin and incident over the three hours of on-track activity as the teams and drivers get down to serious work at the newest venue in the sport. Our coverage of the first practice session begins at 00:45 GMT. Fri 09:02 Lewis Hamilton and Mark Webber demonstrated strong pace during the first two practice sessions at the Korean International Circuit, as track temperatures climbed to 35 Celsius in perfect weather. Tonight, cloud is expected to roll in from the south-west, with an overnight low of 16 degrees as conditions above the Yeongam circuit become overcast. Overcast and rather dull conditions are expected to remain for the duration of Saturday and track temperature will suffer, with thermometers struggling to reach 19 degrees Celsius. The overcast theme will continue into Saturday night and latest forecast models suggest there is a possibility of some light rain arriving in the early hours of Sunday morning. A large swathe of rain is progressing across the East China Sea between the Chinese coast and Japan, with the northern fringes of this rain now expected to clip the Korean coastline. At the time of writing, rainfall totals are expected to be fairly low and the risk is forecast to clear to the east of Yeongam by midday on Sunday - three hours before the start of the race. As the rain clears, so the cloud layer above the circuit will begin to slowly break. Conditions will become a little brighter through the early afternoon and some patches of blue sky are likely before the end of Sunday's 55-lap event. Temperatures on race day will recover to 21 Celsius, but any rain in the morning could have a dramatic effect on track conditions. The potential for a rain-affected race on Sunday is is evolving all the time. We will keep a close eye on the situation and publish a further update in 24 hours. But before then, there are two more track sessions to deal with. 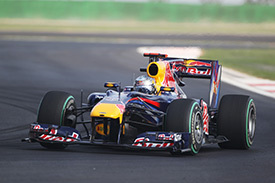 Will Red Bull, McLaren or Ferrari have the quickest car at Yeongam? Join us on Saturday from 01:45 GMT as the story of the 2010 Korean Grand Prix continues. Sat 09:41 Sebastian Vettel once again produced 'the late late show' to take pole position for the inaugural Korean Grand Prix as the clouds rolled in at Yeongam today, heralding a change in the weather. Track conditions have remained dirty and dusty throughout the four Formula 1 sessions so far this weekend. The drivers have worked tirelessly in dry conditions, and the racing line is at least beginning to give a semblance of grip. But, it could be back to square one by the time the formation lap begins because the rain is already rolling in across the East China Sea and on its way towards the Korean peninsula. Rain is expected at the track from around 10pm local time and is not expected to clear until around midday on Sunday - just three hours before the start of the race. The rain will be mainly showery in nature, but there will be some prolonged and moderate pulses from time to time through the night. Sunday will dawn overcast with showers or longer spells of rain through the morning. But, it will clear away slowly to the east during the early afternoon - although conditions are expected to remain overcast and cool for the race. How the 55-lap event develops could now hinge on how long it takes to dry when the rain eventually stops. With high humidity and a low ambient temperature of around 20 degrees Celsius, it may take some time for the surface to dry out. Obviously it is also a major unknown how the rain will react with the chemicals and the oils in the top layer of asphalt, because there has only been one shower of light rain since it was laid. So, Sunday is set to be very interesting indeed. Even if the rain clears several hours before the start of the event, the grip level is expected to change massively from what the drivers qualified on today and tyre wear could be a serious challenge. AUTOSPORT Live will be on hand with all the action from 04:30 GMT as the field of 24 gets to grips with the Yeongam circuit and the battle for the 2010 world championship continues.